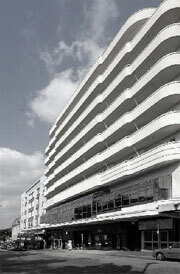 Art-deco flourishes make this a bed breakfast hottie with families and couples visiting Bournemouth on a budget. Located just off the seafront. Accommodation in Bournemouth can often be an expensive beast, with little or no guarantees in terms of quality, which makes recognisable budget brands like Premier Inn something of a no-brainer if you just need a place to rest your head after a show at the Pavilion Theatre, an event at Bournemouth International Centre or just a weekend getting your toes stuck in the sand around Poole Bay. Located just off the beachfront across the road from the Lower Gardens this solid looking art-deco property boasts a generous 120 en suite bedrooms with all the usual signature touches including big cosy beds, air-conditioning and multi-channel television. The hotel receives an additional boost from an onsite restaurant and stacks of discounted parking. Located opposite Bournemouth Pavillion Theatre and the award-winning Lower Gardens. The Beach, Pier and Oceanarium just a five-minute walk down Bath Road. Town Centre location makes it a practical option for transport links. Westover Road is teeming with eateries, bars and cafes like Chimichanga South American food and the Brasshouse. There's also an Odeon Cinema a few doors up. Plenty secure parking at rear of the property. Aavailable at discount rates to guests. Rooms with a balcony and seaviews are available. The Premier Inn Bournemouth Central enjoys an onsite restaurant. Premier Inn Bournemouth Central is just 7 miles from Bournemouth Airport. The hotel is 1 mile from the train station, and Bournemouth's sandy beach and Oceanarium are less than 10 minutes’ walk away.